With no model homes to show or an in-house sales team to troll for new business, custom home builders rely on reputation to sell themselves to prospective clients. So their standard marketing tool is the business card, which hopefully gets passed along by a previous client to relatives or friends. 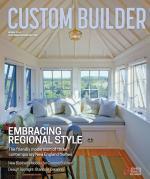 But custom builders actually can have much more in their marketing arsenal than merely word of mouth. John Abrams says his clients do the marketing for South Mountain Company, West Tisbury, Mass. “We just supplement that,” says Abrams, the builder’s chief executive officer. In addition to building custom houses on Martha’s Vineyard, South Mountain also operates an energy-efficiency evaluation service and a retrofit service that bring existing buildings up to energy code standards. More than 10 years of solar panel installation has positioned his company on the island as the expert in green and energy-efficient building and remodeling. That reputation gets South Mountain’s name out into the market and in front of prospects. Besides million dollar mansions, South Mountain also builds affordable housing, an activity that draws local news media coverage. Echoing that sentiment is Bryan Henson, president of Allen Associates Construction, Santa Barbara, Calif., who says builders should engage with the community rather than wait for the phone to ring. Associates had been conducting tours of houses the company built for Habitat for Humanity and used that networking experience to help organize home tours for the American Institute of Architects’ local chapter. About half the homes on the tours are built by Allen, so when visiting architects eventually talk to homeowners, it’s the clients who are providing the unsolicited promotion of their experience with the builder. “We position ourselves to be a resource for architects and designers. Those are the people that bring us work. We put out goodwill. We put out knowledge. So we don’t really promote ourselves but rather take every opportunity where we can to share. Then we let our clients say how great we are,” Henson says. Allen Associates also offers more than a dozen free workshops to the public annually. Some events are staged at the local plumbing supply store and cover such topics as kitchen and bath design, surviving a remodel, how to pick an architect or a contractor, curb appeal, and healthy homes. The company website is another tool custom builders can use to differentiate themselves and convey their reputaton to the market. A builder’s Web presence initially should focus on building an online relationship with prospects so eventually visitors can reach that point where they are comfortable submitting their contact information. Blogging is one effective way for a company’s website to establish a tone that can draw prospects in to check you out, says Dawn Sadler, principal of Idea One Media, a New York- and San Francisco-based marketing consultancy for builders. “When you know your market, you know what to write about, and you can go write about how your product solves their problem,” Sadler says. One example she presented during a recent education seminar at the International Builders’ Show concerned understanding the dilemma of older Baby Boomer homeowners who want to downsize. An appropriate blog for that market might be tips about how to make a current home more marketable so it can sell. Blogs can set the tone and position you as an expert, or at least as a solution to your target market’s problem. A builder’s website also should provide multiple opportunities to download content like a company brochure, design-planning worksheet, and checklist of what you would like to learn about clients during an initial meeting. Each encounter can slowly build trust and eventually win over website visitors into submitting their contact information. 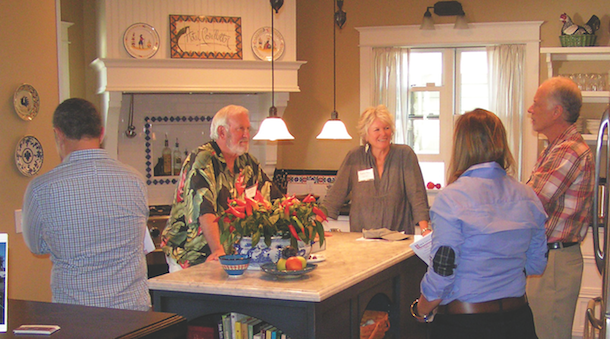 Architects talk to homeowners during a house tour sponsored by an AIA local chapter with assistance from Allen Associates Construction. Good professional photos from a previous project or well-done digital renderings from CAD files can bring a construction project to life when there is no house to show or advertise, says Gary DePersia, a luxury real estate broker with the Corcoran Group, in East Hampton, N.Y. With 3D images, multiple angles can be created both from the ground and air and bring a project to life long before it’s ready for prime time. Marshall Todd creates opportunities for potential buyers to see his handiwork. The owner and president of Marshall Todd Builders, Nancy, Ky., hosts a meet-the-builder party in a finished custom home on a Saturday before his clients move in. Neighbors and passersby are welcome to tour the newest house in the community, but on the Friday night before the crowds arrive, he invites a small group of prospects that he has been courting to a more intimate VIP night with finger foods and a special tour. “It works well because it makes the clients feel special,” Todd says. He’ll also arrange to take prospects to the homes of his clients where they can talk to those homeowners about their experience with the house and the builder. Recently, Todd spent a weekend manning a booth at the annual Home and Garden Show organized by the Lake Cumberland Home Builders Association in Somerset, Ky. The February event attracted about 3,000 attendees including customers who are seriously considering breaking ground on a new house by the spring. Some attendees approach him with plans in hand and ask for his critique. Todd’s booth was decked out with photo albums and TV screens showing videos and stills of past projects. During previous years he gleaned about a half-dozen hot prospects from these shows, and some of those contacts turned into four or five more jobs. And a couple of the referrals turned out being custom houses as big as 10,000 square feet. Brandon Weiss, president of Weiss Building & Development in South Elgin, Ill., has prospects tour his homes while they’re under construction. There, the Graduate Master Builder—who also carries LEED AP certification—uses that opportunity to show potential customers structural and mechanical features that make his houses energy efficient and points out what he does differently from other builders with insulation, windows, and other areas of construction. Comments on: "Home Builder Marketing: Beyond the Business Card"